Born at Sittingbourne, Kent – Aug 20th 1881. Died from wounds, received in action – October 28th 1915. This copy of a diary kept by Sydney Ewbank Speed, during his life as soldier, has been arranged and bound in order that it may be kept by the family as a memorial of him. Extracts from letters written by Sydney Speed to his family and employer can be been found here. Sydney Ewbank Speed was the eldest son of the late Walter Speed and Sarah Ann Speed and was born at Sittingbourne Kent on August 20th 1881. On war being declared between England and Germany, he considered that it was the duty of every unmarried man to place his services at the disposal of his country. 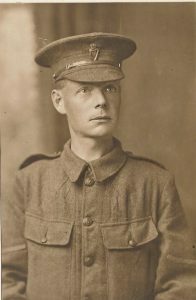 Accordingly, he joined up as a Rifleman in the 18th London Irish Rifles (the regiment he had received his training in as an old Volunteer) and after six months preliminary training at St Alban’s Herts, he left with the 1st Battalion for France. March 8th 1915 to April 21st 1915. The diary covers the period from the time of the departure of the London Irish Rifles from St Albans on 8th March 1915. On arriving in France two days later, they undertook a long journey north by train towards the Belgian border before they moved southwards to the Bethune area to join up with the rest of 2nd London Division TF, who were now part of General Douglas Haig’s First Army. The 2nd London Division (renamed 47th Infantry Division in May 1915) was the second Territorial Force division to be sent to France – the first being the 46th (North Midland) Division, who had arrived a few weeks before them. The 1/18th Battalion, London Regiment (London Irish Rifles) formed part of 5th London Brigade (later renamed 141st Brigade) along with the 17, 19th and 20th Battalions of the London Regiment. Rifleman Speed starts his diary by providing some first impressions of the battalion’s changing environment as they waited to be posted to the Front Line. March 8th 1915. Left St Albans. March 9th. Embarked at Southampton for Havre, entrained for Cassel; this took 22 hours and we (42 men) were penned in cattle trucks lined with straw; could not lie down and could hardly turn round. From there, we went on to La Tempe near Winnezelle, 3 miles from the Belgian frontier. March 18th. Left Vinnezelle, passed through Steevnoorde, Hazebrouck, Morbeque to St Venant, part of the journey by motor bus. Billeted in a bus. March 19th. Left St Venant at 840am – marched 15 miles through Lillers to Burbure; billeted in an outhouse attached to the village shoemaker’s house, who washed himself in about half a pint of water in a small slop basin. This march was in a raging snowstorm all the way, biting wind and cold. Changed billets into a house after the first night, where they made us comfortable. March 22nd. Inspected by General French. March 29th. Went to Auchel (about 4 kilometres away). The Bishop of London held a service in the afternoon. April 2nd (Good Friday). Day gloriously fine, paraded in the morning, religious service in the afternoon. French boys making a devil of a row with things that looked like the old Bow Street rattles and going from house to house collecting eggs. April 7th. Left Burbure passing through Chocque – billeted in an orphanage at Bethune. April 8th. Marched through Annequin, under shell fire for the first time, two of ‘B’ Company slightly wounded. Then on to Cambrin doing fatigue duty – saw some big gunfire. Back to Bethune about 4pm. April 10th. Up at 4am and marched to Cambrin into trenches to brick the floor but did not start as the Germans shelled us out. Went to the rear train digging a new line of defence under heavy shell fire all day. Billeted in Annequin for the night. April 11th (Sunday). Trench digging in the morning – shelled all day, one bursting 50 yards from our billet, it broke all the windows. April 12th. Went into the trenches for 24 hours – for experience, we were with the 2nd Battalion of the South Staffords – we had two men slightly wounded in No 12 Platoon. Left the trenches on 13th – billeted in houses behind the firing line, these had been shelled and were awful wrecks. April 14th. Returned to Bethune. April 15th. Drill and route march (so called rest). April 16th. Same as yesterday. April 19th. Left Bethune for Gorre, about 3 ½ kilos march. April 20th. Paraded at 11pm for trench digging under fire – a rather hot time as it can only be done after dark. April 21st. Returned to billets at 430am. April 23rd to May 29th 1915. April 23rd. Left Gorre for 48 hours in trenches at Festubert. This place has been brought to the ground by shell fire – not a building left – a conglomeration of bare walls, brick heaps and furniture. A quiet time in the trenches, returning to Gorre at 11pm April 25th. April 27th. Festubert. Went into reserve billets behind the firing line for 48 hours – during the night carried water into the trenches. April 28th. Shelled all the morning, the shells falling very close to us – went into the firing line at 11pm – filling sandbags. Back into billets at 3am. April 29th. Back to Gorre. The weather is not beautiful. May 1st. Went into the firing line for 48 hours, then to reserve trenches for 24 hours. May 4th. Back to Gorre for the night. May 5th. Left Gorre and marched to Labuissiere for a rest. May 6th. Promoted Lance Corporal. May 8th. (Saturday midnight). Moved from Labuissiere to a place near Estaires, our brigade being the first line of reserve. Slept in an orchard. May 9th. After a terrible bombardment (the worst I have experienced so far), we moved to Richebourg, a couple of kilos nearer the firing line. Slept in a field. May 12th. Returned from a firing line where we have been as a working party. Still sleeping in a field. Returned in the afternoon to billets at Bethune for a rest. May 13th. Left billet for support trenches at one hours notice, did 48 hours, then back in reserve dug outs for another 48 hours. These dugouts were built by the Germans. We are doing this 96 hours at Givenchy, which is in ruins – a general bombardment all the time, an awful noise, but take no notice of it now. Did not leave Givenchy until the 19th – this is the roughest six days we have had so far., rain, all wet to the skin, clothes have to dry on our bodies, bombarded practically all the time; I have been infested with live stock for several days now. Billeted again. May 23rd. Back to trenches at Givenchy – weather fine. May 24th (Whit Monday). On our left, the Canadians made a successful attack at 230am. From here, about a mile to our right, we can see La Bassee Church, it has a shell hole right through the tower. May 29th. Still in the trenches, been bombed and shelled all the week, many of the shells falling on the parapet, sending sandbags and earth all over the place, but they are very quickly replaced. The 6th Brigade did good work in taking a trench but at what an awful cost (1,600 casualties). I am pleased to say our casualties have been very light. June 1st to September 3rd 1915. June 1st. Relieved by the Canadians and taken into Bethune after 10 days in the trenches – during this time, we were unable to remove an article of clothing – I was lucky to get a wash on the eighth day (the only one we have had). Several losses and the very hell of a time from the German shells; they cannot be short of ammunition. A good billet, salad for dinner. June 2nd. On the move again, back to a place near Annequin in reserve. June 5th. Still in reserve, occasional shelling day and night. With a working party all night at Vermelles, a town that has been shelled by three nations, Germans, British and French. June 6th. Left Annequin at 1045am under sealed orders. After a dreary march, arrived at Mazingarbe – billeted in miners’ quarters outside the town – left in the afternoon for the trenches at Vermelles, no tea and a terrible thirst. The trenches had been held by the French until taken over by the Inniskillings whom we relieved. The trenches here are about 800 yards about. June 8th. Listening post duty all night – very monotonous work, myself in charge of 4 men. June 11th. All the morning with a working party, filling in a pit – we had one man wounded (Northropp). Relieved in the afternoon by the 20th Londons – had a night’s rest behind the firing line. June 12th. Billeted at Noeuux-les-Mines, a fair sized town that has not seen such shelling. First Church Parade for a long time. On parade in the afternoon, the Prince of Wales watching us drilling..
June 13th to 16th. On parade, doing squad drill something worse than St Albans, in fact, there is no rest out here but the same old red tape. On the 15th, we were inspected by Brigadier Thwaites, who informed us were a damned bad lot – in my 10 years of service, the first time I have known them to have anything but a good word for us. What a different speech to that of General French, soon as we arrived in France. On the evening of the 16th, we moved out about four miles, resting in a field all night and next day. June 17th. Went back to billets at Mazingarbe. June 18th. Back again to the trenches where we were attached to the 6th Brigade and relieved the 21st London. June 24th. Relieved by the 17th London and went back to the old billets at Mazingarbe (Bully). This place had the devil of a shelling while we were away, the 17th having over 50 casualties. June 27th. Corporal of Brigade Guard for 24 hours, relieved at 6pm. June 28th. Paraded again at 8am for reserve trenches on top of the coal mine – doing fatigue and working parties – getting a constant shelling all day, which the French are returning. July 1st. Still in reserve. July 2nd. In charge of road control party at Grenay Church – the French soldiers are all drunk in the village. Had new potatoes for dinner and found some fruit. July 6th. Still in reserve but being relieved tonight. Had several casualties while here. July 7th. Relieved last night and went back to Mazingarbe into divisional reserve, the division is supposed to be relieved now and go back for a rest but no. July 14th. We were ordered into the trenches at Vermelles – in the meantime had been doing drills by day and working parties by night. When we moved into the trenches, the rain was falling down; by the time we reached the communication trench, we were up to our knees in water and when we reached the firing line, we were soaked to the skins and spent a short miserable night. The sun is now shining so we may have a chance to get dry. July 16th. Relieved by the 20th London after 48 hours of real misery. Went back into reserve billets, which were tumble down houses about 1000 yards behind the firing line. July 21st. Went into support dugouts for 24 hours. We are now putting the 15th Division of Kitchener’s Army through their facings – they are a Scotch division and a fine lot of fellows – the first to come up were the Camerons. July 25th. Still showing “Kitchener’s” the why and wherefore. The Camerons are now being relieved by the King’s Own Scottish Borderers, another fine lot but so Scotch. In the evening, back to the little village behind the firing line, which we call “Quality Street”. Next day to Vermelles, billeted in a disused brewery. July 29th. From the brewery at Vermelles to Mazingarbe into a school. August 1st. Inspection and drill in the morning (Sunday). Drill in the afternoon. August 3rd. Fell in at 930pm, marched all night arriving about 530am at a place called Allouagne, for a so called rest. August 15th. Still in Allouagne – not much rest here – parade, duties and fatigues all the time – am hoping for a change. August 18th. Left Allouagne for Noeux-les-Mines, here we are digging a fourth line of trenches at Sailly Labourse, about 3 miles from this place on the La Bassee Road – four hours digging each day (an easy time compared with our previous “rest”). August 26th. In the evening, went to Les Brebis near Mazingarbe for three nights digging between the lines – this was a very warm time, we had three men killed and twenty wounded. We are making a new fire trench about 400 yards from the Germans. August 30th. Finished work at 2am at Grenay, marched back to Les Brebis and then by motor bus to Houchin. August 31st. Brigadier Inspection. He personally thanked us for all the work we had done at Grenay and said he was proud to have us in the Brigade. What a different tale from the one on the last occasion he inspected us. Marched from Houchin to Les Brebis –raining all the way – 20 of us billeted in a miner’s cottage. September 2nd. Paraded at 7am, marched to Bully-Grenay, making a brigade headquarters dugout – work till 230pm, then went back to billets. September 3rd. Paraded 745am from home – marched to Houchin – four miles ride to Forquieres, entrained 230pm, raining all the way, arrived Boulogne soon after 8pm, left at 10pm. Very rough crossing, one wave knocking 10 men clean off their feet. Arrived at Folkestone midnight, entrained 1pm, arriving at Victoria 312am Saturday morning on one weeks leave. September 10th to September 24th 1915. September 10th. Left Victoria at 6pm after 7 days leave, arriving at Boulogne 1130pm, rejoining the Regiment at Noeux-les-Mines at 130pm on Saturday the 11th. September 13th. In the evening, marched to Les Brebis. September 14th. Did a day’s digging at Bully-Grenay under shell fire, but rather quiet. In the evening, marched back to Noeux-les-Mines. September 15th. Practised the attack in the morning, a rest in the afternoon. September 16th. An easy day. Went and collected the flags that had marked out the lines of attack the previous day about two miles away. September 17th. Moved by motor bus to Les Brebis in the evening, leaving Noeux-les-Mines about 6pm – paraded at 9pm for a secret working party – returned to billets at 430am. September 18th. Same work as yesterday. September 19th. Digging party – levelling of an assembly trench; returned by Les Brebis bus at 230am, arriving Houchin at 430am, had breakfast and then to bed. September 20th. Reveille at 230am. Inspection of rifles. September 21st. As the 20th. September 22nd. Paraded at 9am – one hours drill under the Sergeant Major, then practised the use of the smoke helmet and other things. In the evening, went by motor bus back to Les Brebis, then to working party. Into billets at 230am. September 23rd. Reveille at 11am. Breakfast at 1130am, then rifle inspection. Dinner at 230pm. September 24th. In Les Brebis. The artillery, having given the Bosches three days bombardment, we were told by our Company Officer that an attack would take place early on the following morning and that the London Irish had been given a most responsible position, being made the pivot battalion of the whole scheme of operations. Of course, this was a day practically to ourselves and in the evening, a little party of us bought half a dozen bottles of champagne to wish one another luck in the coming event (of that little party, we had only one casualty, a slight wound). Leaving the Estaminet at 8pm (this is closing time for all troops in France) and going back to billets, we had a hot supper at 9pm and a tot of rum at 10pm. Parading at 1045pm, we marched to the British front line trenches arriving at 1am, where we kept quiet for the night. At 530am on the morning of the 25th, the order was given for every man to put on his smoke helmet. Now the fun commenced. At 550am, the British started sending over gas and smoke bombs alternately (I believe this is the first time we have used gas in France), this lasted for forty minutes; at the same time, our artillery was giving them hell, the Germans replying with a terrible amount of shrapnel, which did no damage with the exception of slightly wounding one man. At 630am, the order was given for the first platoons to go over the parapet, our objective being to take the second line trenches of the enemy; this second line lay a mile away from us, nearly half left, the centre Company’s (C) point to march on being Loos Cemetery, our objective being a few yards in front of it. As soon as the order came along over our fellows went like one man, followed by the 2nd, 3rd and 4th Platoons at 10 second intervals, all of us being over in 40 seconds. I was in the last platoon (No 12) and, as I got over, I thought what a weird sight it was to see four lines of khaki stepping out 5 paces apart and yet not being able to see the German lines owing to the thick curtain of smoke and gas. No time to be lost now. The whole mass of troops move forward, bullets flying and shells bursting everywhere, fellows falling all around. It was an awful sight, but it seemed to put new life into me; the only thought I had was to get near enough to plug them in the same way. Owing to the thick cloud of smoke, we slightly lost our direction, going rather too far to our left; but the mistake was quickly rectified and we reached their first line, where we came face to face with the 22nd Bavarians – these scoundrels, who had been knocking our poor fellows over and thinning our ranks, as soon as we were on top of them threw down their rifles, put up their hands and shouted “Comrade, Mercy”. If they get any mercy, it will be in hell; the London Irish brought none with them that cold drizzly morning, they were promptly shot by our men. I had the pleasure of scoring a bull twice in succession, and also of making sure that several others had gone to the one and only place fit for these big paunched dirty pigs. It did not take long to finish this lot, the work of a few minutes, then on again to their second lines nearly 1,400 yards away. The Germans were still giving us a nasty time with shrapnel and petrol bombs. I saw more than one of our men alright. Their rifle fire was now weak but they had several machine guns playing on us. Eventually, we reached our objective (how I got there without being hit, I don’t know), to find out that they had cleared out and all that was left for us to do was to drop in and start reversing matters and consolidating our new position. From here, we could see the enemy running through the village, but not many could have got away as the 19th and 20th London had gone on in advance of us our part in the game was finished, except to hold what we had taken, which we did in regular bull dog fashion, for four days, miserable weather, getting three good soakings, our clothes drying on our bodies. September 26th. The Germans during the time we held our new position gave us a nasty time with a machine gun (which could not be located) and shrapnel. It had been raining all day and wet to the skin, we were relieved by the 2nd London at 10pm and so back to Les Brebis. September 29th. Arrived in Les Brebis at 130am and into billets in houses – some of the best we have had in France – a tot of rum and down to the boards in our wet clothes to sleep, which, I think, was the one and only thing we needed just then. September 30th. Left Les Brebis for Headigneul in Army Corps Reserve. October 4th. Moved to Haillicourt for rest and to be refitted. The weather was very wet for several days. October 7th. Had a bath – the first since I left England on September 10th. October 8th. Paraded at 730am for field work, returning to billets at 3pm. Stand by all night, ready to be called out at half an hour’s notice. October 9th. Inspected by General Rawlinson, commander of the 4th Army Corps. After the inspection, he thanked the 5th Brigade for what they had accomplished in the recent assault. October 11th. Practising shallow extension in case of artillery shelling a body of troops marching in column of route. October 12th. Our morning’s work consisted of half an hour each of Company Drill and elementary musketry. Left in the evening for Mazingarbe, billeted in the “Mairie” – confined to billets for two days. October 14th. Went to the trenches about 5 miles distant, the German side of Loos. Relieved the Munsters who had been in the line for nine days. October 21st. After being in the firing line since the 14th, we were relieved by the 17th London and went back to Loos into an old German communication trench, which is being put ship shape in case of emergency. October 23rd. Only two days in reserve when we had orders to relieve the 20th London, which we did at 8pm.